Although I eat out often, I'm still a frugal foodie. And being one, I want to get the most out of a dining experience but at a reasonable, or better yet, discounted cost. So after a series of discount dining adventures courtesy of group buying sites, I bring you yet another episode. This time, it's a meaty feast at Brazil Brazil. It was last year when I first saw Brazil Brazil's Churrasco Feast Platter deal at Metrodeal. But for some reason, I wasn't able to grab the chance that time. Luckily, Metrodeal offered a flashback for this meaty treat last month. And although the deal's only on for their Serendra branch, my date and I didn't mind the long drive to Taguig (Okay, I'm lying.. Of course, the one who drove minded it). For those of you who haven't heard of Brazil Brazil yet, it's a haven for PETA (People Eating Tasty Animals) members. As far as I know, they're the only establishment in the Metro offering Brazilian Churrasco BBQ along with international dishes in their buffet spread. Our lunch at Brazil Brazil was not for the buffet though, but for their Churrasco Feast Platter which also included free meal starters, drinks (wine or iced tea) and desserts. First on our table was this big plate of Caesar Salad. Since my date isn't a fan of veggies, I took down this serving of fresh lettuce, tomatoes, cucumbers and onions all by myself. We were then given a serving each of Brazil Brazil's Crab and Corn Soup. I really liked the consistency of this bowl of soup, not too thick but not too watery. The peppery taste was a little overwhelming though, but my date liked it. After a few minutes, we were then served with the star of that afternoon -- the Churrasco Feast Platter. My date and I both looked in awe at the sight of the glistening beef brisket, pork belly, hanging tender, pork shoulder, chicken thighs, frankfurter sausage, banana (Saba) and Japanese corn atop a hefty serving of java rice. Before going to Brazil Brazil, I was planning to take into account the taste and texture of each meat cut for the sake of this post. However, that plan was thrown out of the window when my date and I started digging into this platter. Every piece was flavorful, although I preferred the pork pieces than the beef since I find the latter quite tough. The frankfurter sausage and chicken thigh were so juicy, meaty and really good too. 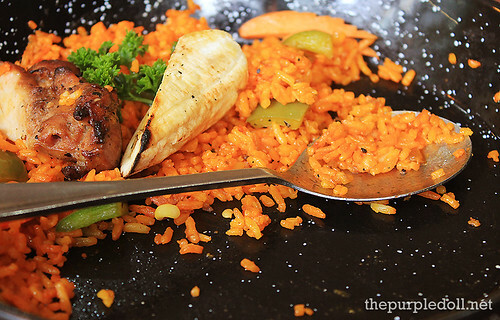 And, I was surprised with the java rice as it was very flavorful compared to most (almost flavorless) java rice from other restaurants. Although I'm a hefty eater, I surrendered to the Churrasco Feast Platter. I didn't eat the extra beef and pork pieces since I was already having a bad case of meat fatigue. For the first time in my life, I craved for veggies. And no, I'm not joking. In all honesty though, despite my 1-day veggies craving, I can't help but say "sayang" in my head whenever I see this photo of the unfinished, unexploited platter of goodness. To end our calorie-overloaded lunch in full swing, my date and I devoured our cups of ice cream -- Strawberry for me, and Chocolate for him. 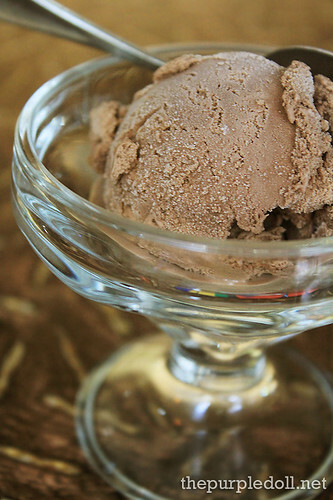 These may not be the richest, most flavorful ice cream we've tasted. But after a hearty meal, these cups were just the perfect meal enders. Brazil Brazil may not have the most delicate premium cuts of meat in town. 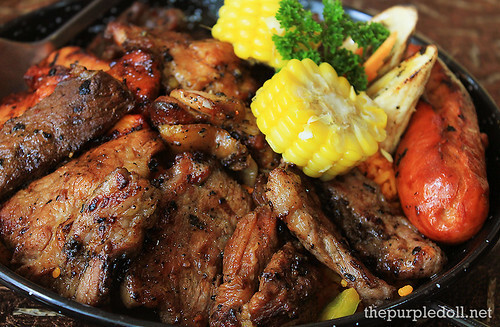 However, if you are a meat lover who just want to pig out on flavorful meaty treats and get your money's worth, then this is definitely the place to be! With good food, a bright and festive ambiance, coupled with great service, I can definitely say that this deal is sulit. And if there'll be another deal for Brazil Brazil some time soon, we won't be thinking twice before hitting the buy button. Too much meat overload. Lol. It's great you tried their Serendra branch, I heard their service there is way better than the branch in Metrowalk..
@Gellie Abogado: I actually never thought meat fatigue was possible, but it happened to me.. @__@ Anyway, I think this platter is good for even up to 3 people. That CHURRASCO FEAST PLATTER is so tempting..I would surely get it even if it would make me not frugal with foodie..wow i'm imagining it right now..
waaaaaaaaah! so meaty..ahihihihi..super nakakagutom pictures mo Sumi! wow looks yummy! and I work near Piazza! the churassco feast platter looks yummier than 3/5 haha, but of course i'll take your word for it and would try this soon. it looks a good value for money with that perfect rating! Yummmmmy! I'm sure I'd enjoy a meal there. For the foods posted herein, I may say that this food adventure of yours is a "mighty, meaty, feast at Brazil, Brazil" The place is very nice and price is reasonable! Note to myslf. Dont read a post when u are hungry. 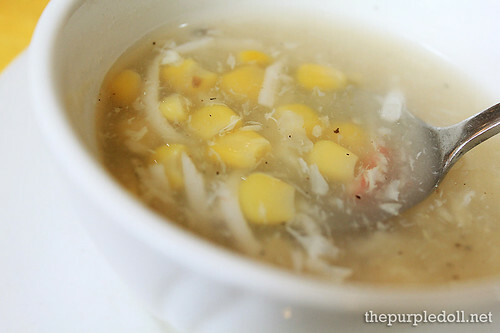 Now i crave for the corn soup. I'm not much of a meat lover but that platter sure does look tempting. Haha. My bf is also the one who ends up driving for my whims. XD Pero that's how we feel their love naman diba? Hahaha! Anyway, looks awesome. The feast platter looks soo tasty and filling. This is really mouth watering... great shot, it really made the food looks really delicious. Hahahaha I was just looking at the platter of meat and I felt my blood started to thicken. Nakakatakam naman! Lalo na yung ice cream. Hahaha. Gusto ko din magpurchase ng vouchers sa metrodeal. someday, someday. haha. Yah me too lately iniiwasan ko na meat, I'm having meat overload too! If I forced myself Di ko sya nauubos Sayang Lang... But it looks yummy nga! you really have the talent to show the world how food will appear more delicious and attractive through your posts. That platter of grilled meat is mouth-watering. Hmmm.. yum yum yum! I recall this from Metro Deal tama? I was planning to get two vouchers pero yung mga negative feedbacks from MD made me a bit hesitant. Sayang! hmmm, i missed ceasar's salad. the masks and the colorful ceiling paints reminds me of the carnival. I actually have this thing Crab and Corn Soup. YUM YUM! 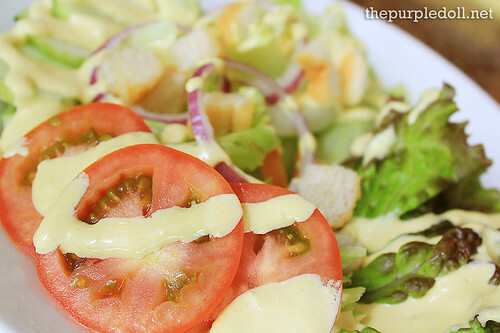 This post just made me crave for yummy foods! Gosh, I could eat that platter now! haha. Would want to cook something but I'm stuck, I just would love to look at the photos here.....hope they motivate me..
Nice place to eat! :P Yummy foods! wasn't able to buy the voucher for this kind of feast :((( sadness...another great food Sumi! another mouth watering post as usual. Would love to try all these restaurants you reviewed. The meat platter is a real feast. Corn soup is my all-time favorite as well. I'm a rice freak :) will try that tasteful java rice you mentioned. I would love to taste the Caesar Salad! Btw, I couldn't help not to notice how beautiful your photos are as always Sumi! Ang ganda ng place..ang sosyal..hehehe..
Now this made me crave for ice cream! Summer is so in! Lol. I go for that Caesar Salad. I'm still on my diet so I basically would go for the greens. Haven't been to Brazil Brazil in a while but it still looks like the same meat extravaganza from before. The first and last time I ate in Brazil! Brazil! was 2007, in their Rockwell Branch. I still have the yoyo! kakain ko lng nang bfast bgla nako nagutom ulit waahahah! 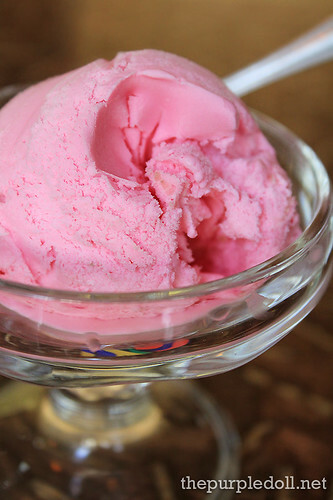 ..made me crave for ice cream..
Will check this out when I have the chance to go back home. Seems really good. It's nice to know that Metrodeal delivered what is expected from this deal. Great interior and the food looks really yummy. I love all the colors! Yum I always wanted to try out Brazilian food! I've tried the buffet of Brazil Brazil several times already. When I saw the deals in the group-buying sites, I wanted to buy this deal too. However, I was afraid of how big the serving will be and what is included on the deal. Now that you posted this, at least I have an idea. Thanks! 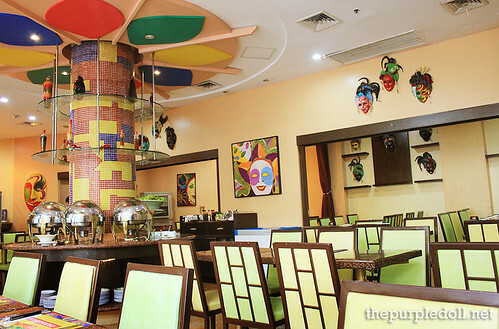 colorful interior and the food looks so masarap! The place really caught me. It's nice reminiscent of how colorful Brazil as a country is. The food, I can't whisked-off anyone of them. But I'd go for the platter and salad. The Caesar Salad and The Churrasco Feast Platter bought me-off. I'm really interested how you took your photos. It's really nice. Do you do some settings in your cam? Would love to hear some tips. Overall Delicia amazing atmospheres, the enjoyable entire body of staff, and incredible products turn this into go shopping my visit!! !